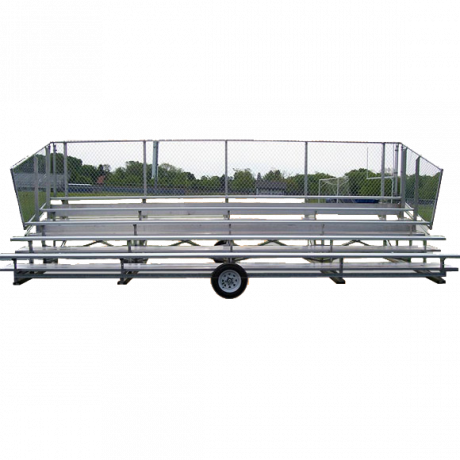 Portable aluminum bleachers are designed to withstand the rigors of movement at a top speed of 5 mph, however they are not intended for use on public roadways. They are beneficial for moving bleacher systems from one field of play to another within the same park or recreational area. Most schools and athletic complexes have many different fields for different sports during different seasons. These portable bleachers will allow you to move your sports seating to any field necessary. 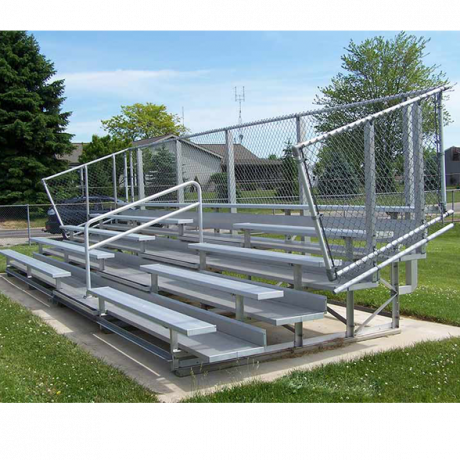 This will save you the expense of buying school bleachers for each athletic field. 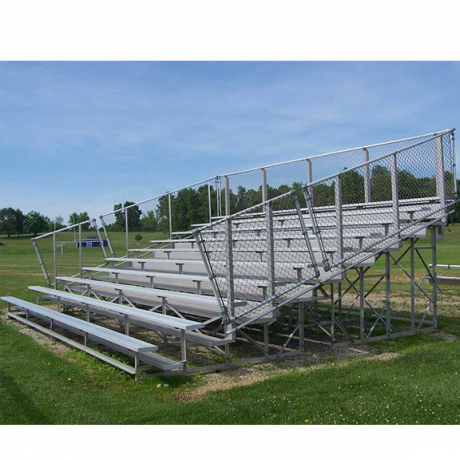 These bleachers can be moved from field to field according to where your athletic event is taking place. They are fitted with a galvanized steel lifting brace and have extra bracing to stabilize the bleachers during transport. 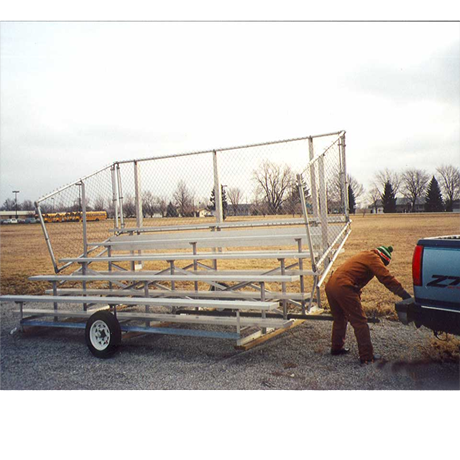 All transportable bleacher units include ground sills, but may need to be anchored to resist hazardous winds. Each seating system includes wheel attachment brackets and horizontal lifting braces. 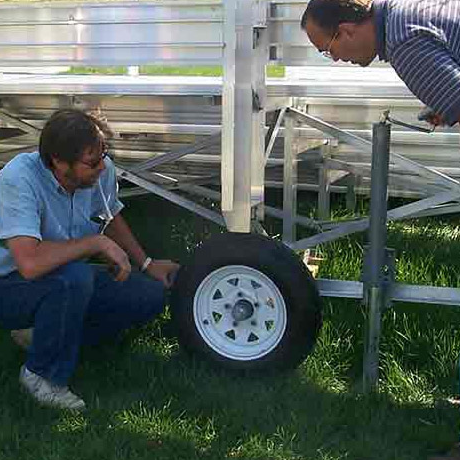 A transport kit (which is not included with the bleacher system) is necessary to move the bleachers, however one kit will move several sets of bleachers. 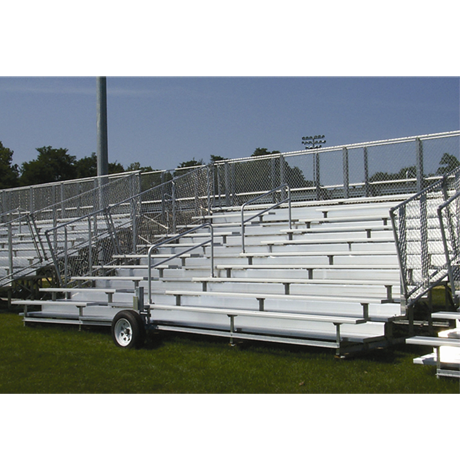 Portable bleachers are available in standard, preferred or deluxe models and are the perfect solution for adding temporary seating where permanent year round bleachers are not required. All of the above options can be manufactured with either an aluminum or galvanized steel frame. You can also choose a vertical picket or chain-link guardrail with any option as well. The vertical picket guardrail is recommended if being used by small children due to the inability to climb the guardrail and less chance of children getting stuck. When ordering bleachers we advise you to check your local requirements for such things as aisles, guardrails, ADA, or other conditions. 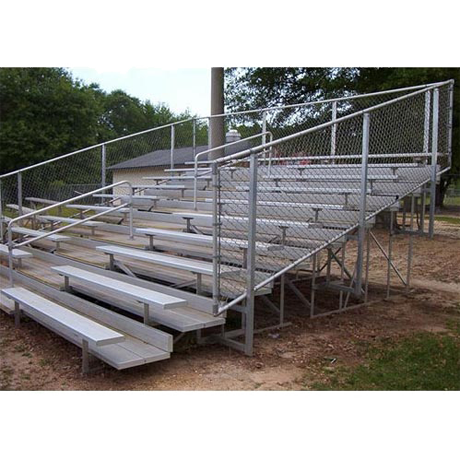 Check your local building codes before purchasing or request our Bleacher Safety Guide to ensure your seating is 100% safe. Call and let our friendly sales staff help you choose the perfect Transportable Non-Elevated Bleachers!